But not enough to annoy the psyche of the small master. Still not confused? In our extensive selection of design projects for boys, there are options for all occasions. We hope that among the presented interiors you will find an inspiring design that will help create the design of a kid's room that suits the kid and does not ruin the family budget. 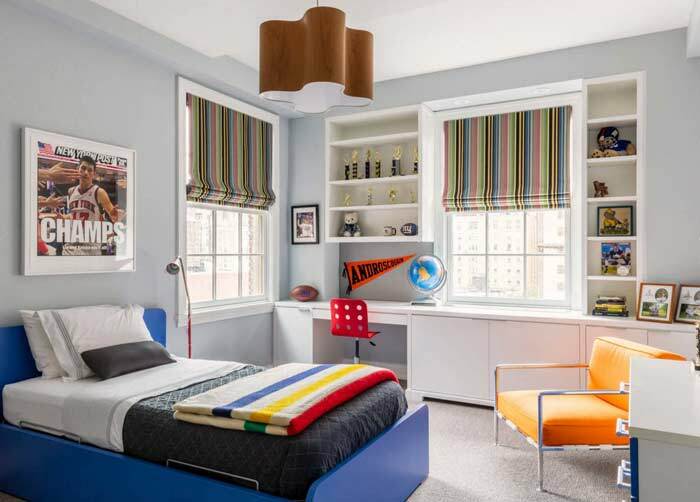 The first and most important aspect of creating a comfortable and functional interior of a boy's room is the age of the boy. For each period of your baby's life, different priorities are. 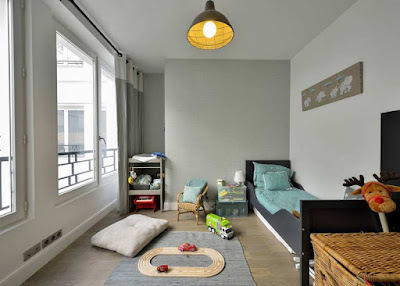 First, he does not have his own preferences and the design of the room should be generally liked by parents, set them up in a calm, pacified mood. If the parents are happy, then the baby, feeling their mood, will enjoy life. 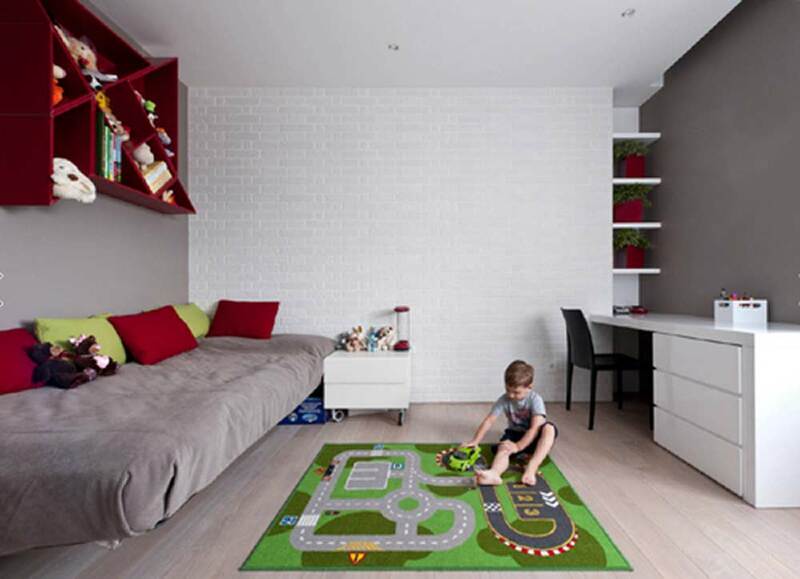 As you grow up, your kid has his favorite activities, preferences in games and creativity. Heroes of cartoons and fairy tales become an integral part of a boy's life, and he wants to see them in the interior of his room. Then the games are gradually replaced by classes, the preschooler is already doing a lot and he needs storage systems not for toys, but for books and sports accessories. In the future, the school will completely replace the toys from the kid's room. Well, in the teenager's room, parents do not have much to decide at all - the kid has his own opinion not only about the layout of the room, the color of the wallpaper, but also the figure covered for beds, covers for decorative pillows and not only. In the first years of the baby, the design of the room is important first of all for the parents. As a rule, for a newborn the room is decorated in soft, pastel colors, using bright accents as toys and stickers in the recreation area and games of the baby. 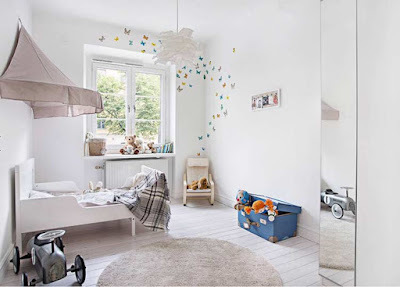 The boy begins to crawl and then walk, so in the priority of the boy's room environment - safe furnishings, minimal decor and simple but warm carpet that can be easily washed at home. Rounded corners on the furniture, proportional to the growth of the kid table and chair, convenient storage systems without doors and sliding mechanisms - all these design techniques will help create a comfortable and safe atmosphere of the kid's room. During this period of your life your baby begins to actively show his own personality, he can already tell about his desires, preferences. 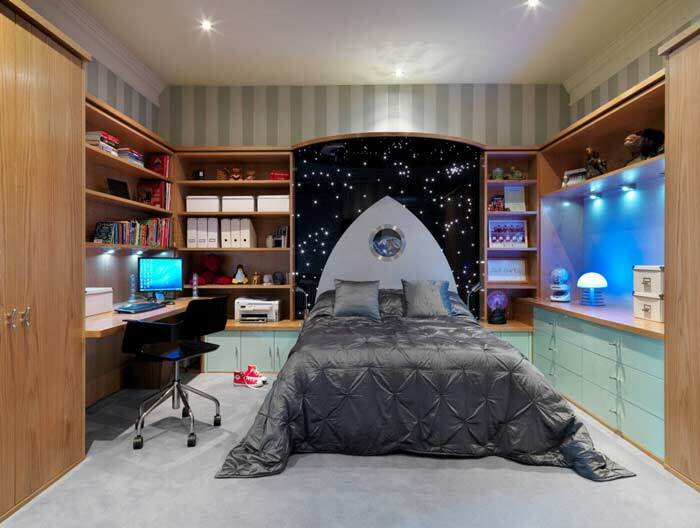 The kid will be grateful for the comfortable atmosphere of his room. And for parents, it is important that furniture is made from safe materials, easy to clean and not present a danger. 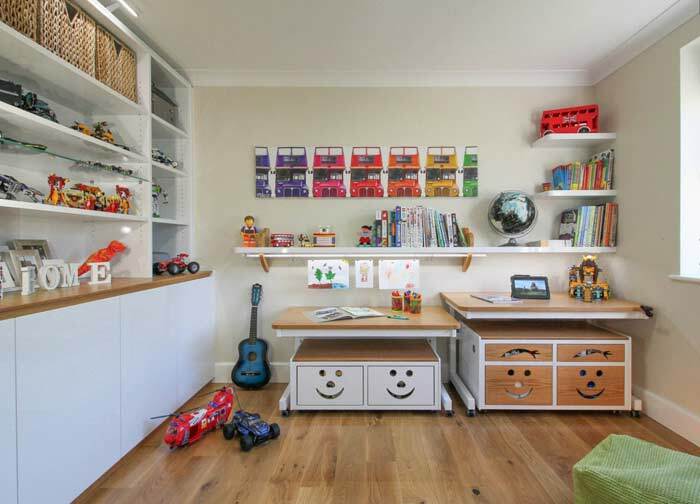 Therefore, it is better to limit ourselves to open shelves for toys and books or to use drawers with limiters. At the age of 3 to 5 most of their time in the kid's games and exercises in creativity, so the parent's task is to provide a convenient and safe place to have fun baby. 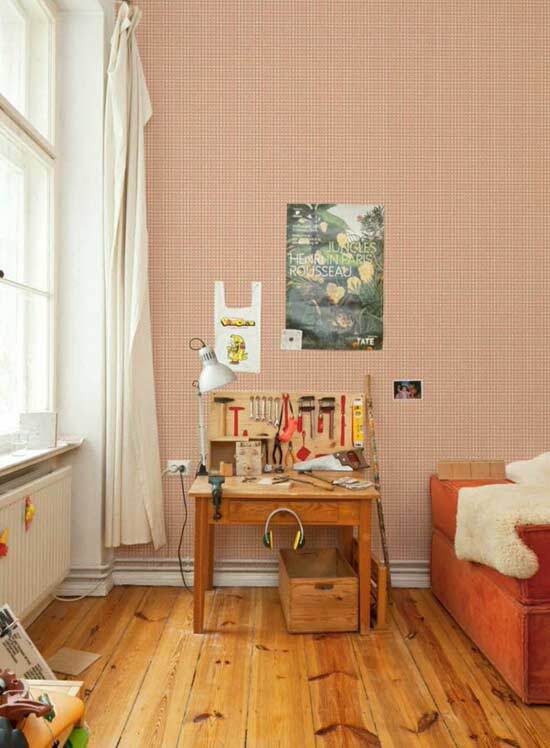 If the room space allows - be sure to install sports equipment - a Swedish wall or crossbar with rings, rope. The physical development of the kid at this stage is extremely important. If the boy's room for more than 6 years old The boy still spends a lot of time in games, but classes become an important part of his life. 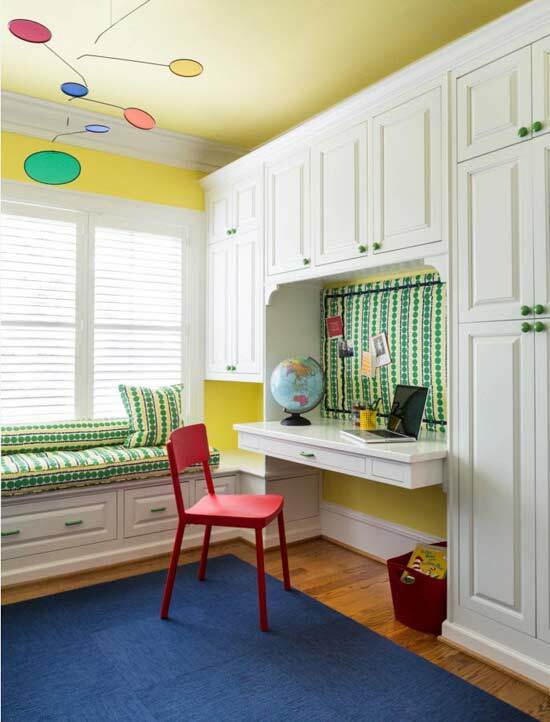 Therefore, the acquisition of a desk and an adjustable chair or chair with a backrest becomes a priority for parents. In the preschooler's room, there are still a lot of toys and they need appropriate storage systems, but open shelves with books already take up a lot of useful space in the room. Why limit yourself to a board for creativity or occupation, if you can use a whole wall? In stores, there are enough products for this - you can install magnetic blocks, to which elements of creativity are easily attached and the surface is erased with a usual wet sponge, painted black on the board, which is convenient to draw and leave notes, and fabric segments to which you can attach on the Velcro. kids adore such zones for creativity and classes in game form are more fun and effective. If there is a bay window in the kid's room, the arrangement of this zone can become a secluded corner for the kid- in this segment, it is possible to organize a place for privacy by hanging curtains and providing seating in the form of frameless poufs or usual pillows of bright colors. The space around the window is rarely used rationally in the homes of our compatriots. This is mainly due to the location of the radiators under the window sill. If you slightly transfer the radiator, you can organize a full-fledged workplace with a natural light source and a variety of storage systems located around the window opening. With age, your kid's priorities change. If earlier he spent most of the time in his room in games, now he is mainly busy with preparing homework and creating. But this does not mean that the entire situation of the boy should be replaced - for sure your student already has a desk. Now it is important to re-equip the storage systems for toys under the book racks and containers for sports attributes. The kid-schoolboy has his own duties, but this does not mean that he stops playing. 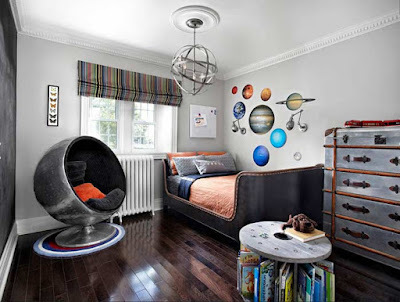 Therefore, the main point in the design of the room for the boy is a clear zoning space. It will be more convenient, practical and rational if the areas of study and creativity do not overlap with the segment of games and sports. 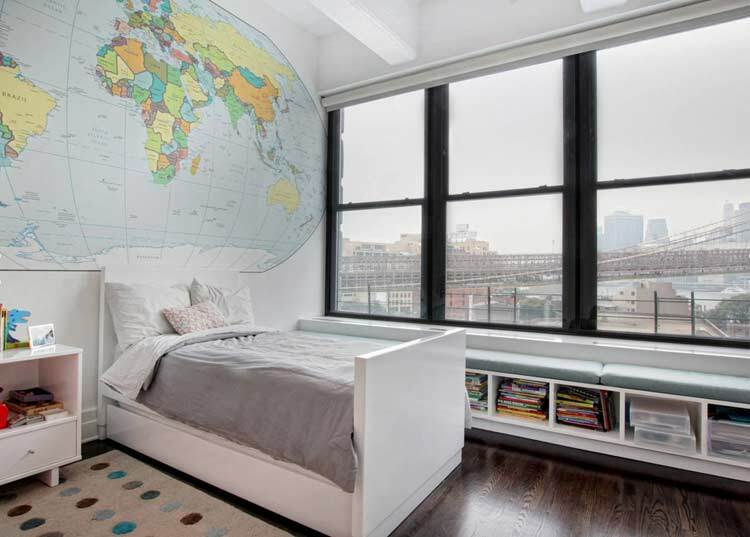 If your student enjoys geography, travel stories, customs of different countries - a large map of the world, the interior of the room must be present. 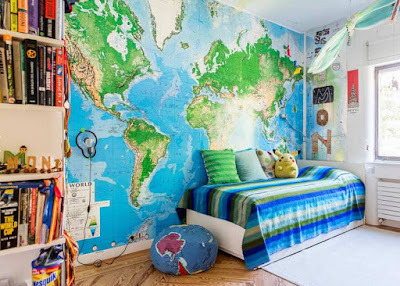 With a large map or wallpaper with photo printing, you can not only provide information to your curious kid but also create color accents in the decoration of the room. 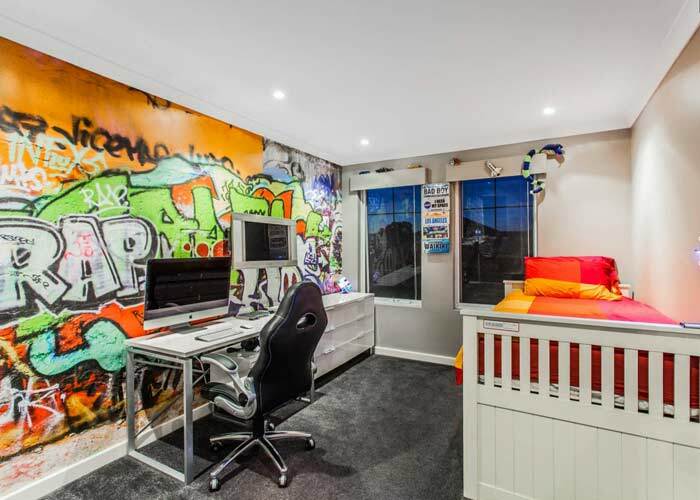 In the room of a teenager, you simply will not be allowed to use wallpaper with cubs or typewriters. It is necessary to reconcile with the idea that changing the decoration of the room for a teenager is inevitable. 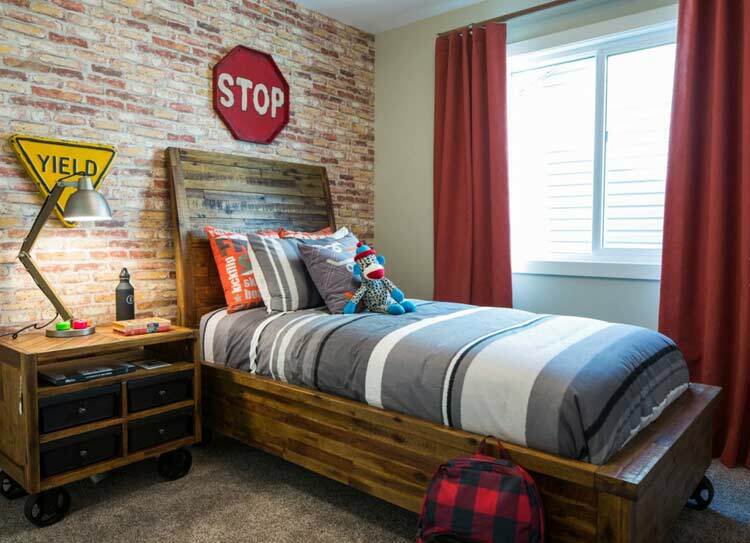 As an accent wall in the room of the growing future of a man, you can use the imitation of a brick wall. 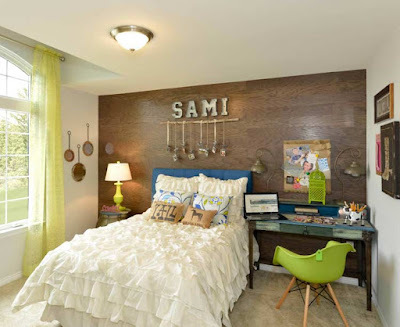 Such a design technique will bring a touch of brutality to the interior of the room. Also, to accentuate the walls in the teen's room, you can use wallpaper with photo printing. The image depends on your boy's addictions - from photos of real cities or places to the symbolic image of comic characters or street graffiti. 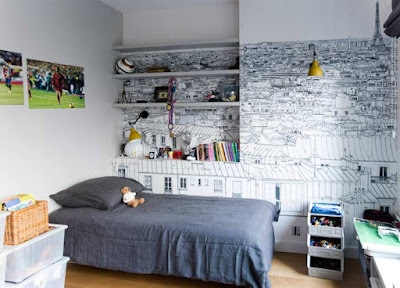 An interesting idea for the execution of the accent wall - wallpapers that can be painted on their own. Usually, the surface of this type of wallpaper is easily cleaned - your boy can make more than one attempt. 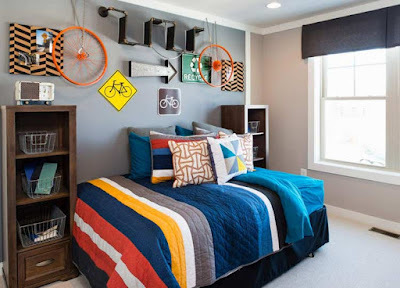 Often adolescents choose to decorate their rooms with dark and even gloomy colors, parents have to obey the choice of a kid, because he is in this room most of his time. But growing men still need bright colors, accent spots in the interior. The easiest way to bring color diversity to the gray interior of the room with a wall decor or a variegated textiles - bed covers or curtains for draping windows. Only at first glance, the organization of one space for two sons doubles the problems of parents. 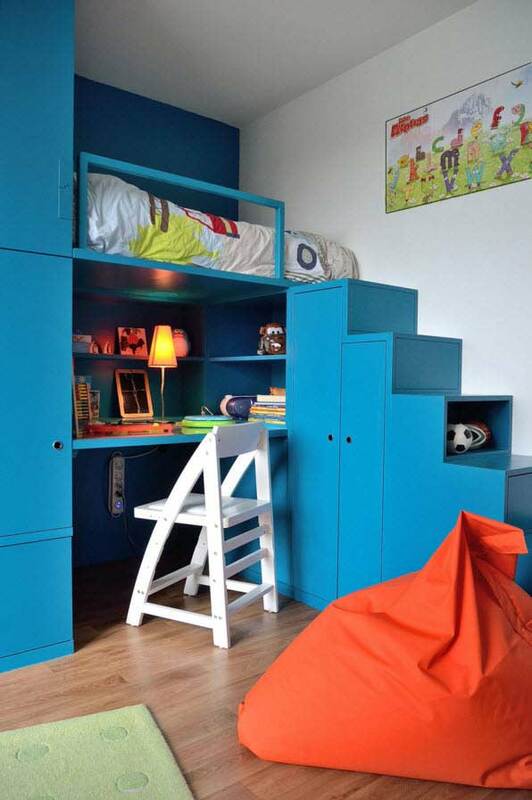 It seems that to place two sleeping and working places in one room, do not forget about the storage system in a double size and at the same time leave enough space for games - it is impossible. But you will come to the aid of design ideas that have been tested on thousands of families, formed over the years and served faith and truth in more than one generation. 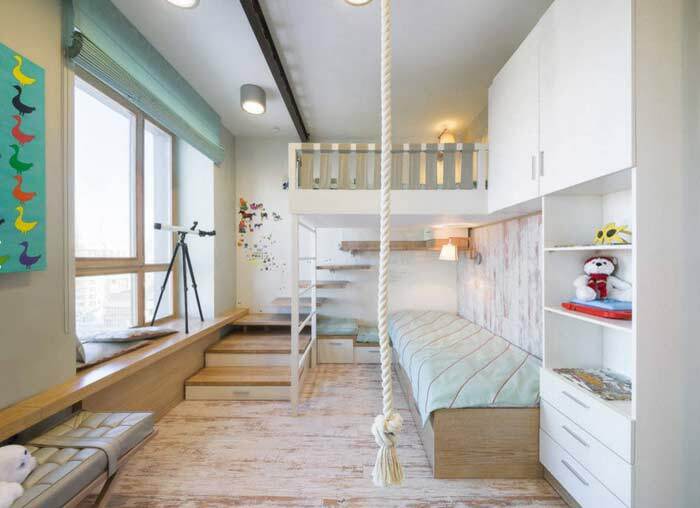 A bunk bed is one of the most popular and practical options for arranging two berths with a minimum of useful space in the room. 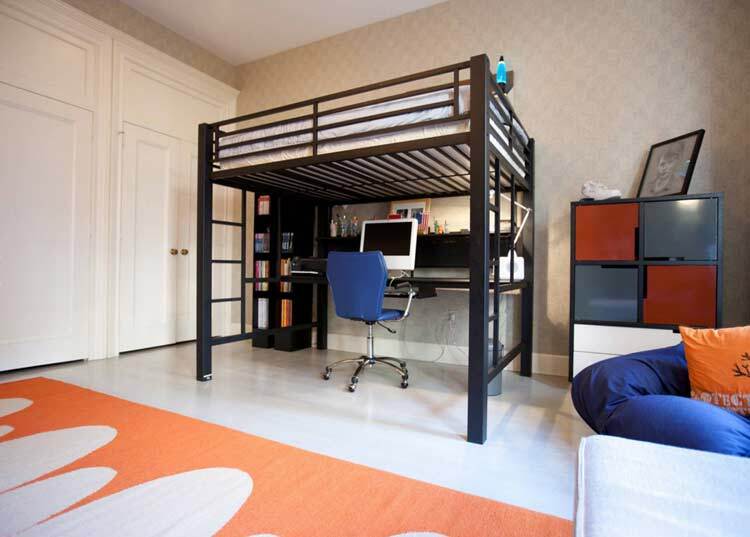 If the boys have a big age difference, then using a bunk bed with a solid frame will not be practical. In this case, it is much more effective to use a loft bed for a young boy, and underneath place, an adult's sleeping place. 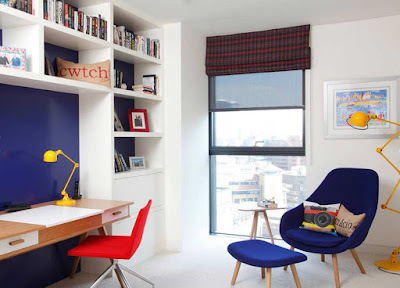 Usually, with this arrangement of places for sleeping and rest, there is a place for storage or arrangement of the zone for classes or creativity below. 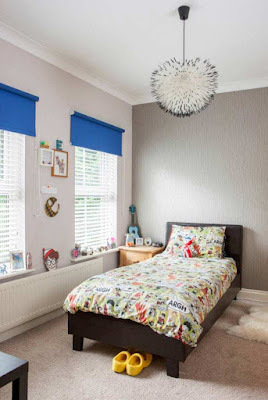 If the room space for two boys of the same age allows, the arrangement of free-standing beds will be an ideal option. If you can create mini-houses for each of the sons, we can assume that the mission of the parents is completed. 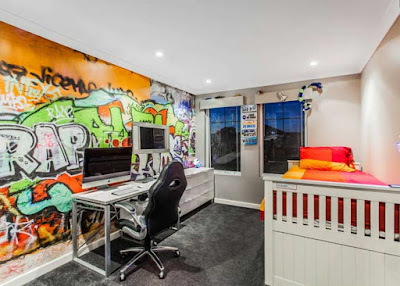 In the room for two teenage boys, you will need to attend not only to the ergonomic arrangement of beds but also to the organization of a desk for two. Here are examples of such jobs that meet the rules of ergonomics and have an attractive appearance. Most of the standard apartments in our country can not boast of large rooms, and private houses often have situations where a very small room can be allocated for the arrangement of the room for the boy. Before parents, the question of arranging a comfortable and ergonomic bed, installing a desk, is quite urgent. And it's still important not to forget about all kinds of storage systems - for clothes and shoes, toys and books, subjects for creativity and sports. 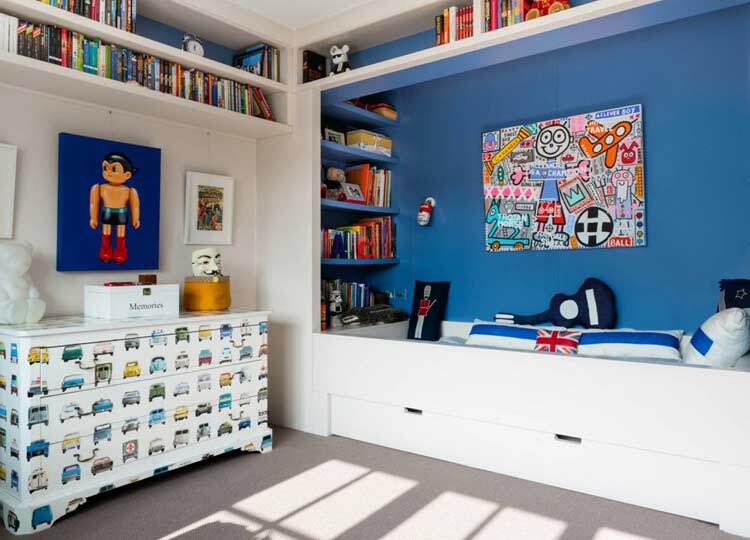 In this case, come to the aid of years-proven layouts and multifunctional furniture - beds with drawers at the bottom, built-in storage systems that easily transform into bookshelves or shelves for sports equipment, puffs with space for storing toys inside. 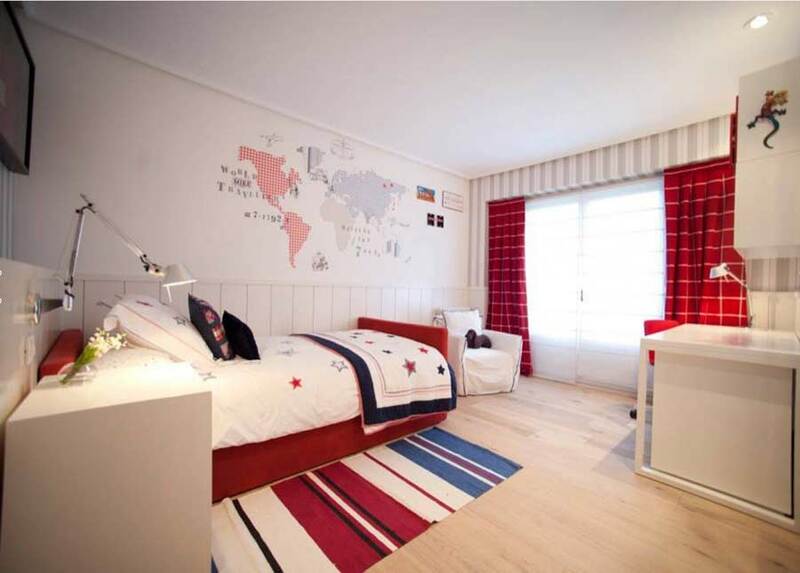 Residents of Russia who have passed through living in small communal apartments know perfectly well that in a small room furniture must be placed along the walls. 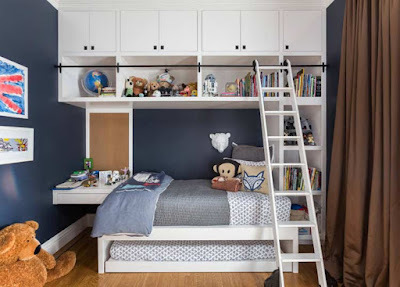 In the case of the organization of a comfortable room for a boy in a small space, this principle works fine - install a desk near the window, and place the bed perpendicular along one of the walls and you will have enough space for games. As storage systems use open-type hanging shelves. 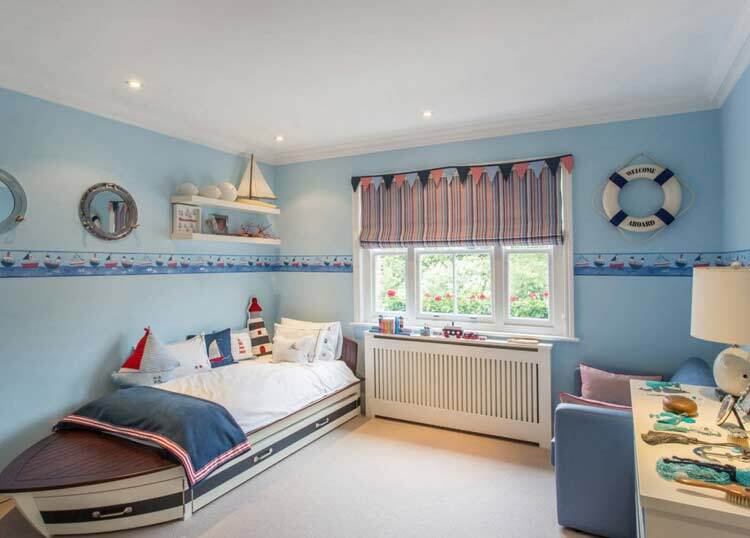 Snow-white walls and light furnishings will help visually expand a small kid's room. If you use mirrored surfaces as a decoration for one of the walls or part of it, then visually the room will have no boundaries at all. 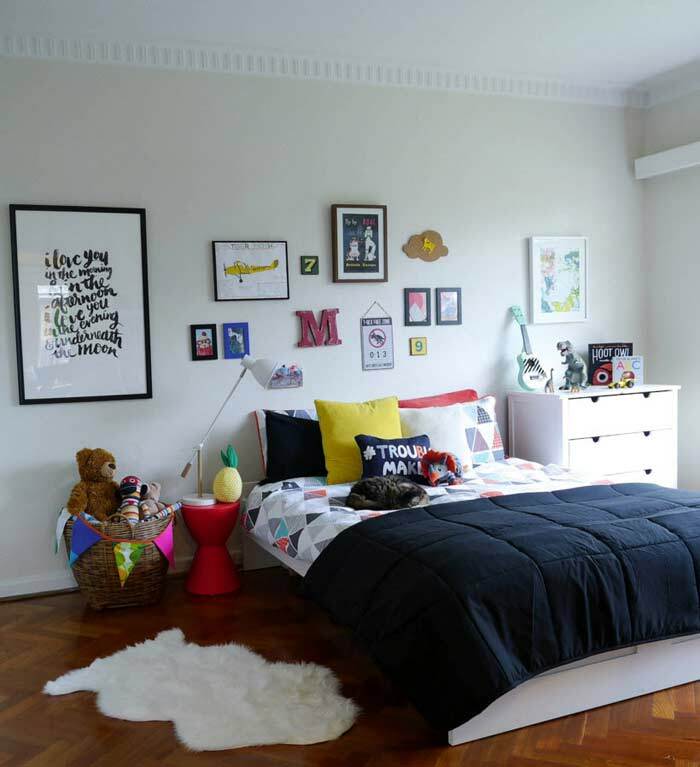 Bed-loft helps to save a significant number of square meters of the kid's room. Under the sleeping place you can place storage systems or organize a zone for study or creativity, just do not forget about providing this poorly lit place with artificial light sources. 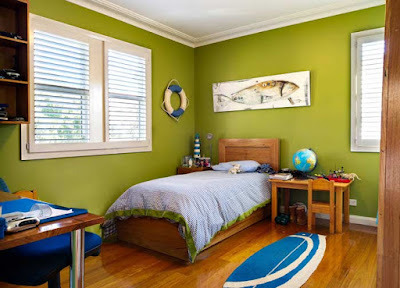 Many boys like sleeping places on the dais, and under the bed you can arrange a place for privacy, if you hang the curtains - it all depends on the temperament of your boy, only the parents know what is needed for their boy. Here is an example of a built-in furniture complex consisting of two beds (one of them is pull-out), a workplace, cabinets and open shelves. 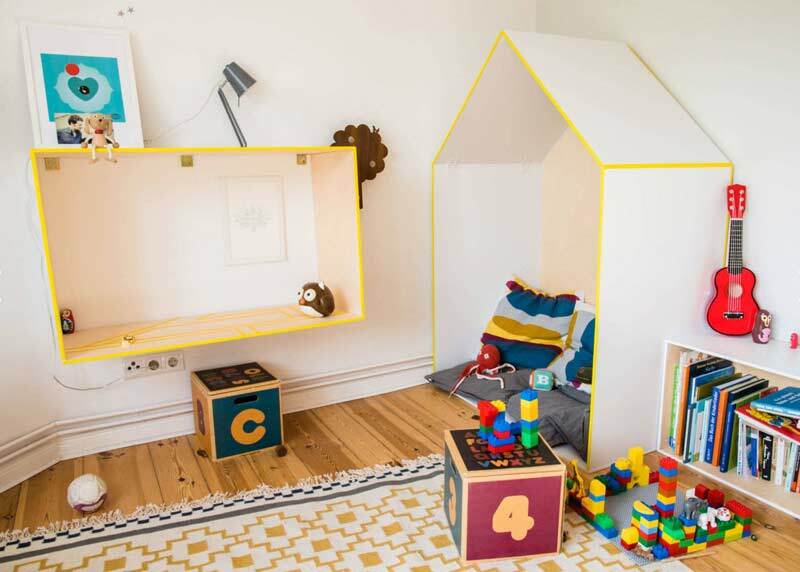 Even in a room area of 10 to 12 square meters, you can organically fit such a complex, while the kid will have a little free space for games. 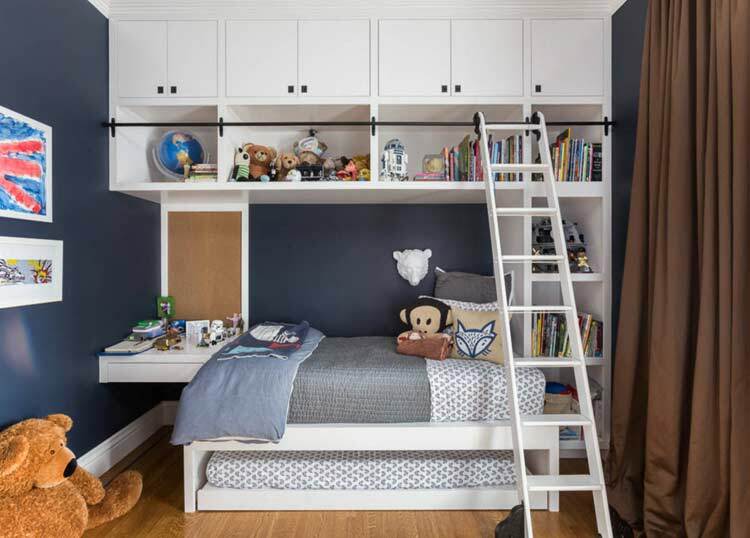 Built-in furniture significantly saves the space of the kid's room. First, you have on the open shelves of built-in storage systems toys, then they are replaced by books. The only thing you have to worry about is the size of the built-in bed. Either it will be necessary to equip a sleeping place with a significant stock, or to change the furniture in 2-3 years. 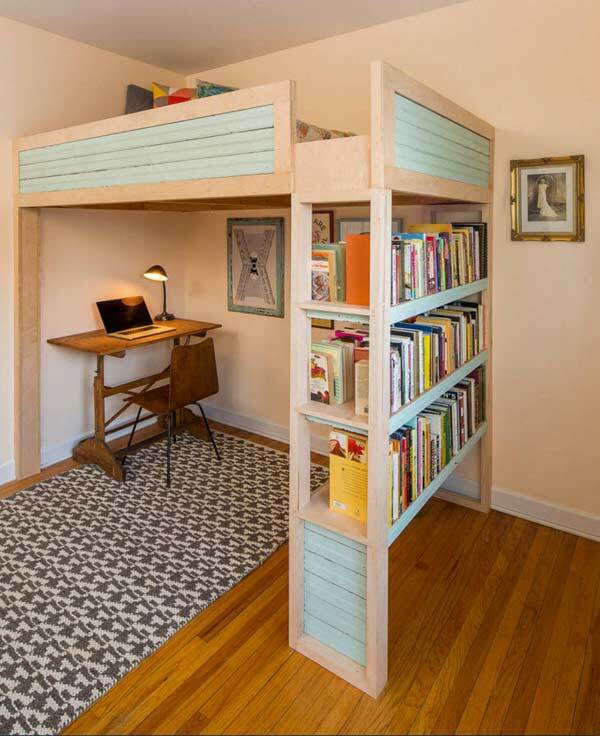 Will help to save the useful space of the room bed, located on a certain elevation. In the bowels of such a podium, there can be a roomy storage system. 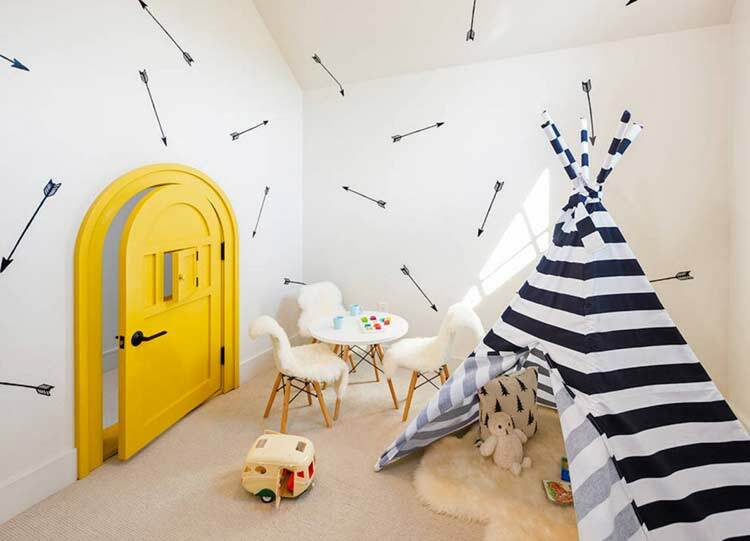 For a room located in the attic room, the complexity of the arrangement may not be so much in the size of the nursery as in its irregular geometry and large skewing of the ceiling. 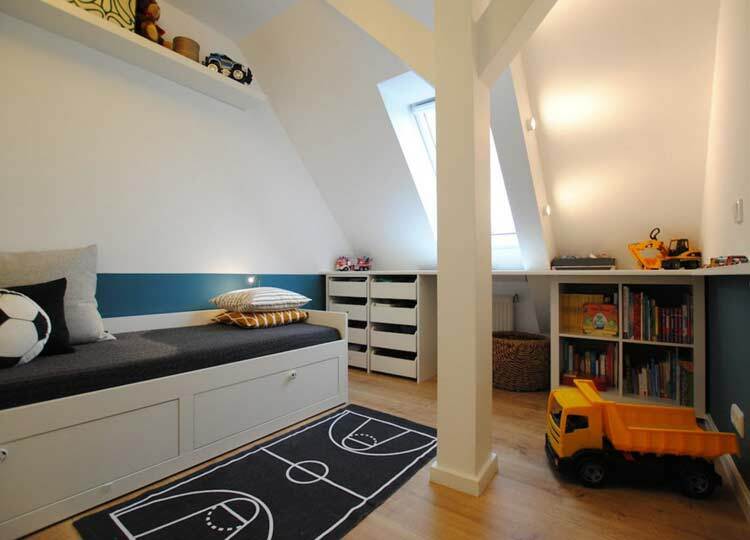 In such spaces, usually in the zone of the lowest height of the ceiling, there are storage systems - low shelves for books and toys. The workplace should be placed at the window, if the geometry of the room allows, the remaining space is distributed under the sleeping and rest zone. 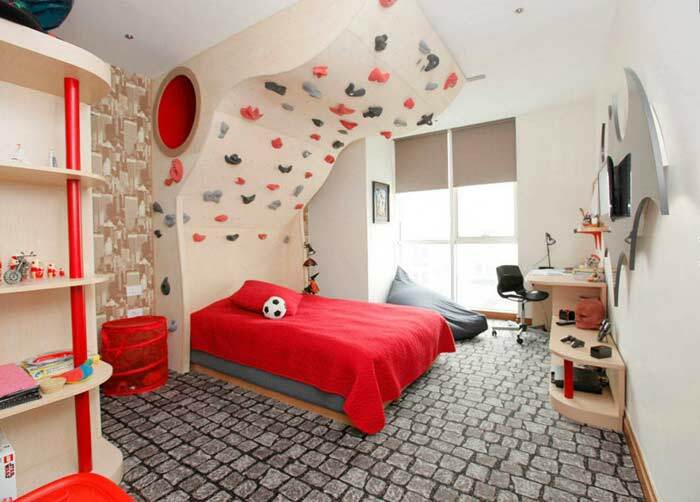 If your boy is fond of any sport, then surely he will enjoy playing around with this theme in his own room. 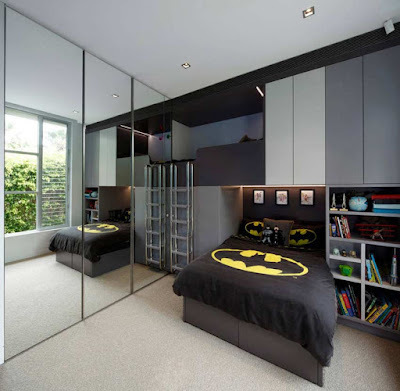 It is not necessary to arrange a gym in the son's room. There are many ways to outplay the sports concept - a pattern on textiles, small pieces of furniture in the form of sporting shells and just a wall decor with posters and pictures depicting the subjects on the chosen topic.